Is Street Art part of contemporary art or is it a phenomenon apart? Hardly classifiable since its inception, Street Art has, in any case, acquired a major place in the recent history of creation. Today, this artistic movement enters the Musée es Beaux-Arts in Calais. 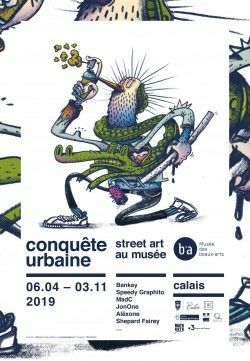 Through more than sixty works, including some outstanding loans, creations of avant-garde artists from the 60s to today, the exhibition CONQUEST URBAN offers to return to the origins and evolution of Street Art. There is no review about Exposition Conquête Urbaine, be the first to leave one !